(Washington, DC)  Just in time for the five-year anniversary of the street protests that grabbed global headlines for seventeen days straight, Orange Revolution, an award-winning documentary by veteran filmmaker Steve York, has begun airing around the country on public television. Hailed by film critics as "lively," "exciting," and "fascinating," Orange Revolution is being distributed to local public broadcasting stations for a two-year period by Executive Program Services. Viewers interested in seeing this ninety-minute film should contact their local PBS stations to request the stations pick it up from Executive Program Services and schedule it at a convenient time. Its first broadcast was earlier this month on KPBS in San Diego. An official selection at some of the most distinguished documentary festivals in North America, including Hot Docs Canadian International Documentary Festival in Toronto, United Nations Association Film Festival, the Seattle International Film Festival, the San Francisco International Film Festival, and the AFI Fest in Los Angeles, Orange Revolution captures the spirit and the determination of the most successful nonviolent political protest of the decade with riveting footage, in-depth conversations, and live musical performances. Orange Revolution poses a timely challenge for citizens going to polling stations around the world: Just how far would you go to defend your vote? It was just after 2 a.m. on November 22, 2004, when the call went out: "The time has come to defend your life and Ukraine. Your victory depends upon how many people are ready to say 'No' to this government, 'No' to a total falsification of the elections." Regime-controlled media claimed victory for Viktor Yanukovych, handpicked by the corrupt sitting president. But credible exit polls showed Viktor Yushchenko, the opposition candidate, had won. It was shocking enough that Yushchenko had been poisoned -- and nearly killed-- while on the campaign trail. When reports came in of blatant voter intimidation and damaged ballots, people were outraged. When they realized election officials were in on the fraud, the people had had enough. In freezing temperatures, over one million citizens poured into the streets of Kyiv and took up residence there. They marched in protest and formed human barricades around government buildings, paralyzing all state functions. Restaurants donated food, businessmen sent tents, and individuals brought blankets, clothing, and money. Rock bands kept their spirits up with open-air concerts, day and night. For seventeen days, these throngs of ordinary citizens kept up their extraordinary resistance, demanding their votes be respected, standing firm even when an internal army is mobilized to remove them. Capturing the songs and spirit of this historic moment, Orange Revolution is the story of a people united, not by one leader or one party, but by one idea: a better future, in a country of their own. "It's exhilarating to watch what happens when ordinary people, who are normally considered powerless, recognize their own power, and decide to take action. In this film, we see Ukrainians, long described even by themselves as passive and apathetic, at a historic turning point. While Ukraine's democratic transition remains incomplete, the Orange Revolution brought permanent positive changes for the Ukrainian people including electoral reform that has yielded free and fair elections, the emergence of a lively independent media, and a healthier balance between executive and legislative power." Orange Revolution is a York Zimmerman Inc. production, presented by A Force More Powerful Films. The film is produced and directed by Steve York. The editor is Joseph Wiedenmayer. Managing Producer is Miriam A. Zimmerman. Associate Producer is Sommer Mathis. Executive Producer is Peter Ackerman. Distributed by Executive Program Services. 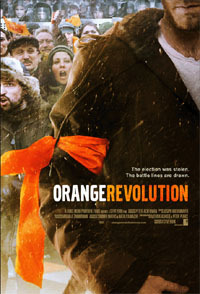 Images available at www.OrangeRevolutionMovie.com. Also available on DVD from Amazon.